Charge your devices through a USB charger or easily sync them at home or while on the go. 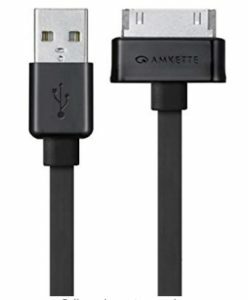 This Amkette cable will cope with all your daily needs.Amazon is selling Amkette 30 Pin to USB Charging & Data Sync Cable (Black) worth of 529 at Rs.349 . 1.5m long cable ensures that you can simply use and carry it anywhere be it office, home, car, etc.